My least favorite kombatant since the original game, Kano returns next year in Mortal Kombat X with some killer new moves and looks that will both stop and start traffic. The older, wiser Kano has received some serious cybernetic upgrades since last we saw him, accessorizing his signature glowing eye with what looks to be a traffic signal. 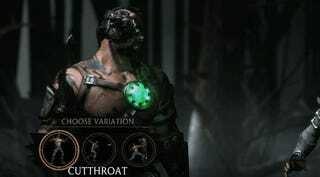 Green means Cutthroat Kano, who pounds his cybernetic heart to power up his deadly knife attacks. Red means Cybernetic Kano, giving him plenty of long-range laser and grenade attacks.Yellow signals Commando Kano, who loses his underwear in exchange for enhanced grappling attacks. My god. I may actually play Kano for the first time in more than a decade. Nicely done, Netherrealm.